July 10, 2011: Two for Thailand ... + two more sold to good homes! 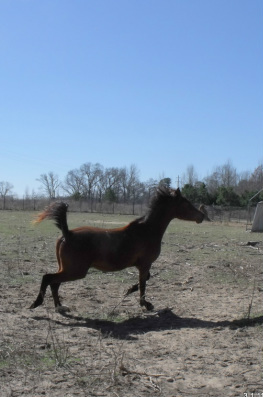 Thanks be to God, for the wonderful new homes 4 Diamond Magic Arabians have found over the past month. MS Enspiration, 2005 bay mare, and Ben Hisan, 2008 black stallion, are bound for Thailand (photos above left & below, more on separate page) while Dustinn Hisan, 2008 grey gelding, & Balssa Nova, 2010 black filly, have found loving new homes right here in Texas (see photos above, center & right, + more on separate pages). Several wonderful Arabians are still looking for their "forever partners" ... if you have love & time to share, check out our "Sales" pages! Time payments available with generous terms ... good homes are always the most important consideration. MF Montana Sundown, 2006 bay 7/8 Arabian 1/8 Saddlebred gelding, who went to a new home on Jan. 31, has returned ... his new owner decided that she wants to do endurance trail riding, and Sunny's extra-long pasterns are definitely NOT suited for anything that stressful, so he is again available for your consideration. 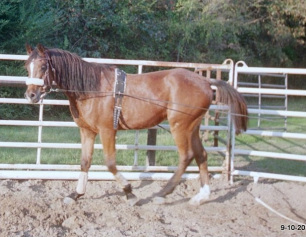 Sunny needs a small, light-weight rider, or perhaps a career as a fine harness horse. GOOD HOME MORE IMPORTANT THAN PRICE. NEWSFLASH -- July 28, 2011 ... Sunny has found his "perfect home" in Athens, TX. Congratulations to Stacey Dunn & family! May you always enjoy your new horse! Sunny has 3 donkeys who are quickly becoming his buddies, & acres of good grass, with people to pet him & love him ... horse heaven, here on earth! Balssa Nova (Gilbriar Balcones x MS Balivia) is a black (or bay?) purebred filly foaled June 7, 2010, to my black, pure Polish mare who was on lease. Sadly, Balivia died in October, and shortly thereafter, this filly and others were confiscated / rescued ... this filly was in custody of the Humane Society of North Texas from late October, 2010, until she was delivered to me on March 4, 2011. She slowly learned to trust me not to hurt her, & she definitely looks forward to her feed buckets! She is wild and uncatchable, but I'm beginning to win her confidence ... at least she now allows me to touch her, most days. NEWSFLASH ... June 2 ... Balssa Nova has found a loving "forever" home with John & Carol Potter, who purchased Dustinn Hisan ... "Shadow" fell in love with John & followed him around, asking to be petted ... they are doing well together, thanks be to God! Diamond TSaber, 2007 bay purebred gelding ... FOR SALE ... $1250 cash / $1500 terms ... this BIG, strong, athletic, kind & gentle gelding will win your heart. Bred to be a sport horse / dressage / hunter pleasure show mount, he could also do Western, trail, reining, endurance, or most anything his new owner desires, with proper training. Tall & elegant, TSaber is ready to begin his saddle training. Check the "horses sold" page for photos of his close relative, Diamond TSolstice, who is in training now with Connie at Equitech Stables in Round Rock, TX. Connie tells us that TSol is the "teacher's pet" and is learning very fast. TSaber has all the same potential ... just needs the right new owner to be his "best friend forever" & share adventures. 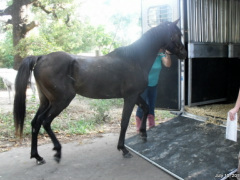 More new photos of TSaber & other sale horses will be posted to the "Sales" pages, as time permits.